ON A SUNNY SPRING DAY IN 2008, I AWKWARDLY SLOGGED up a steep, snow-covered slope just outside of Bridger Bowl’s south boundary. This was Slushman’s, as it was then known — 1,700 feet of mostly untracked powder, all saved up for those with juice enough and time enough to skin from bottom to top. I had time, but hardly enough juice. My old tag-a-long randonee gear had skins made for skis that were skinny, not wide as barn siding, and I slid backwards repeatedly, particularly when negotiating the steep switchbacks. My partner implored me to keep up, that there’d be time for dilly-dallying when we reached the top. It was sunny and hot, but still morning, and the snow was heavy and crusty, not light and fluffy as I had hoped. I would have to settle for it being about manual exertion on a sunny day, and having a mountain to ourselves. At the top, there were a handful of others who had also skinned up. The talk was about the new lift going in; the concrete platforms were already in place. Could it be good? Bad? It would be different, for sure. Though it was my first time up there, I empathized: We, the backcountry skiers, were being rendered obsolete. My buddy and I made our hard-earned turns down the steep and wide open No Name Bowl, while the others continued their trek south to Saddle Peak. Clearly, Saddle was the prize. No Name was fine with me — easy to get to, and I didn’t need a fear factor of 12 to add to my flailing. It was enough to hike and ski Slushman’s before it was too late. ONE YEAR LATER, Bridger is a different place. 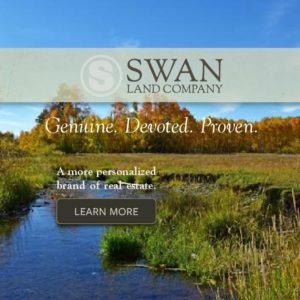 Slushman’s, the quiet and pristine place, has been re-branded as Schlasman’s, Bridger’s new 337-acre expansion, and No Name has a name: Mundy’s Bowl, after a ski patroller who died in 2005. The lift is complete, whisking skiers the 1,700 vertical feet to terrain deemed “extreme.” Riding up the lift, rows of cliffs drained by narrow chutes punctuate the steep terrain. The runs are long and interrupted. There are no trail markers, and nothing is roped off. I’ve been warned about getting “cliffed out,” by people who have experienced the concept firsthand. As with Bridger’s celebrated Ridge, skiers and boarders are required to carry an avalanche transceiver. But unlike the Ridge, there’s not an exhausting 20-plus minute hike to access it. The Schlasman’s lift plops you off right in the middle of it. That has been the Bridger Ridge philosophy for years — but without the hike, what’s to keep intermediate skiers from dropping in? As she says this, a snowboarder leaps the cornice on Saddle’s summit, and two more fall in right behind him, not waiting till the first one reaches a safe area. As we ski a narrow chute filled with heavy snow into the relative safety of Mundy’s Bowl, I realize that, despite its dangers, I won’t have skied Schlasman’s until I’ve skied the Saddle Mountain slackcountry. MY PARTNER IS A LANKY SKIER named Kyle Steger, a baker in the base lodge cafeteria who knows Bridger and the surrounding backcountry as well as anybody. Everyone calls him K-Y. And so, here we are, on the narrow Ridge above Mundy’s Bowl, skis strapped to our packs. The day is cold, gray and windy. We hike to the ski area boundary, and another sign. Are we prepared to die if we misjudge the avalanche danger? Me, I’m not so sure. K-Y has climbed and skied in the Beartooths, Tetons and Denali; his easygoingness is complemented by experience, so it sets my mind at ease. Plus, we’re not alone. A handful of other skiers and snowboarders are making the hike up Saddle, too. His job also allows him the previously unknown perk of sleeping in the base lodge on powder days. I appreciate his light-hearted nature, but I’m still nervous — because of the steepness of the pitch, and because the top of Saddle is lined with tremendous wind-built cornices. But this is not a big, untouched powder field. It hasn’t snowed in several days, and the upper flanks of Saddle are scraped clean of fresh powder. The scariest part is the drop off the cornice onto the steep, hard slope. K-Y does it effortlessly, and I watch as he makes easy turns to a safe area below. 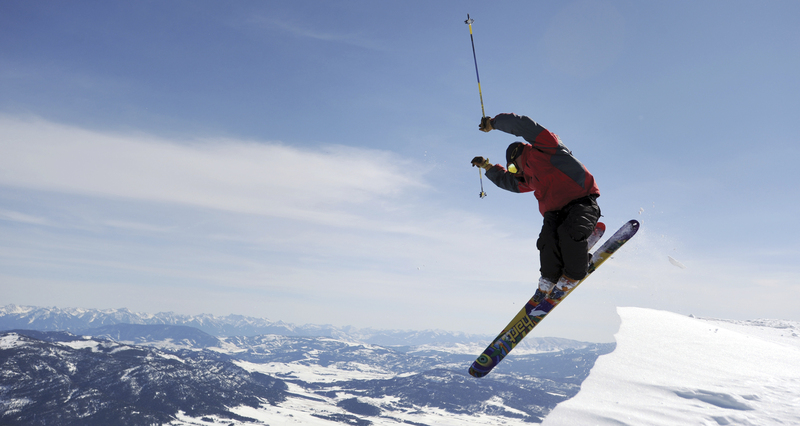 I follow, leaping off the cornice and landing solidly, making reasonably smooth turns to the safe zone. We ski along a ridgeline to a wide chute called Going Home, which skirts around Saddle’s intimidating cliff band. The snow here is soft but heavy, a welcome relief from the harder stuff above. The run is long and tiring for me, but K-Y is excited to make another run. He wants to show me an area called Argentina, as far south as you can hike and still get back to the lift. As I board the chair, I wonder what I’m looking for. Fresh snow? Danger? A good story? I feel like I just want to get back home in one piece. Back on Saddle’s ridge, we hike to its southern peak. The wind continues to blow. Cresting the cornice onto the south summit’s face, the snow is twice as hard as on the last run, and I nervously skitter my way south to catch up with K-Y, making a long traverse. Finally, we reach a wide ridge marked with chutes. “If you can’t find powder here, you won’t find it anywhere,” he says. And sure enough, he’s right. He guides me to a chute with only one set of tracks down it, while he goes off to find one for himself. Making my turns in the deep snow, it all starts to make sense. The slackcountry is really fun. DAYS PASS, WITH NO NEW SNOW. General Manager Randy Elliott invites me to talk in his office, and I come at what appears to be an inopportune time — he’s helping coordinate a rescue. A skier set off an avalanche on the backside of Saddle, and Gallatin County Search and Rescue sent in a helicopter. Elliott is finishing up with logistics. Talking to him about Saddle, it’s hard to imagine the rescue isn’t weighing on his mind. 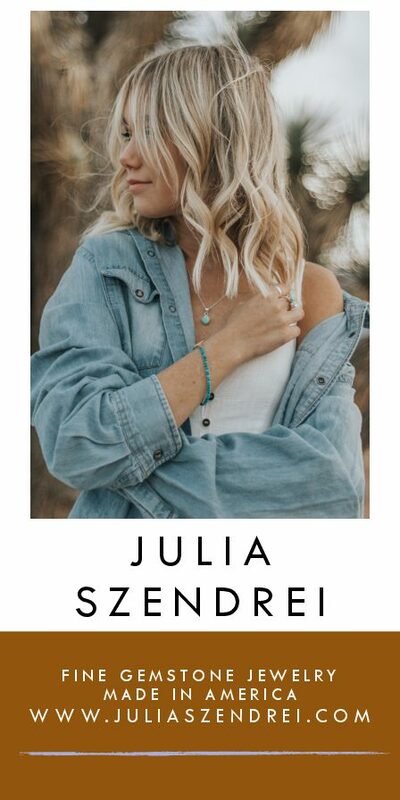 “Even though you’ve got skull and crossbones, and ‘This is your decision point,’ people still stream out there. We knew there’d be some of that, but it’s been pretty amazing how clueless some folks are,” he says. “It just goes right by them. They just don’t get it, or they just are convinced it’ll never be them. THE NEXT DAY I PAY A VISIT to a subdued K-Y in the base lodge kitchen. He hadn’t skied that day, because he visited his buddy in the hospital. His buddy had ripped his quadricep from his knee; he was the one who had been caught in the avalanche the day before. K-Y was there, well below and safe, and had called in the rescue on his cell phone. “He just slid out of sight, and we didn’t know if he was buried or not,” he says. Another friend, up high, had seen it happen, and called K-Y to say he could see the skier above the snow. The skiers below skinned up to him. K-Y says it’s the first time he’s ever had something like that happen. His friend will be off skis for six months. “Oh, yeah, it definitely gives me pause. It’s a terrible situation,” he says. AT LONG LAST, THERE’S FRESH snow at Bridger. As the Schlasman’s lift opens, a mass of smiling skiers patiently forms at the bottom. On the lift by myself, I consider my options. I could go left, and take my chances on Saddle. I recall the sign, and I think about what K-Y said about death being a part of life, and how it’s sometimes good to be scared. As I get off the lift, I make my decision. No, I’m not prepared to die if I misjudge the avalanche hazard. What am I, crazy? I’ve got better things to do. Instead, I shoulder my skis and head up the boot track to Slushman’s Ravine, a run I skied earlier in the week with photographer Anne Sherwood. Then, the snow was scraped off and we were petrified as we picked our way through the narrow, icy couloir. But now… it was a dream. The snow was soft and powdery, and my turns were confident and easy, straight through to the bottom. There may be something to be said for fear. We all have our epics. Mine will have to wait. BRIDGER BOWL’S 8,800-foot Ridge first opened to the public in 1973, but for Bozeman skier Tom Jungst and his cohorts from the era, the deep-snow winter of 1979-1980 was when it really all began. Jungst and friends Jim Connelly, Scott Schmidt, Emil Tanner, Dave Wachs, and U.S. 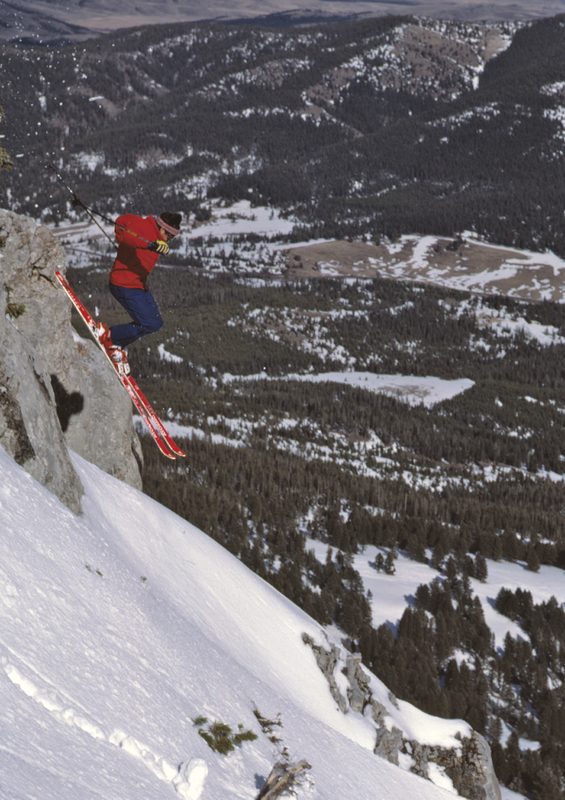 Ski Hall of famer Doug Coombs, looked at the Ridge differently from those who just yearned for deep powder. They took a competitive approach, making 12 to 14 Ridge hikes a day, in what Jungst refers to as “mini-golfing.” Influenced by local rock and ice climbers, the group sought out not wide powder runs, but narrow chutes and cliffs. Writer Tim Cahill and photographer Paul Dix chronicled the group’s exploits in a Feb. 28, 1985 Rolling Stone article called “Going to Extremes — Adventures in the Endo Zone.” Soon after that Warren Miller came to film a ski movie, and word of Bridger’s intense Ridge was out. Jungst notes that the opening of the Schlasman’s lift marks a new chapter in extreme skiing at Bridger. “I’m nervous about the expansion, in a sense, but it’s pretty awesome to see people skiing Saddle non-stop. That will create big mountain skiers,” he says. A skier launches himself into Slushman’s Ravine at Bridger Bowl in Bozeman, Montana. 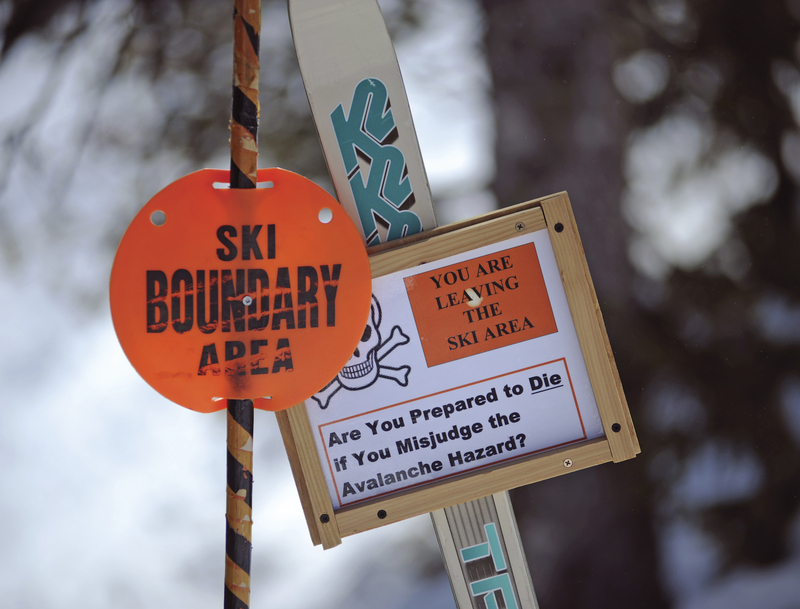 Signs warn skiers of the hazards ahead when they ski outside the Bridger Bowl boundary. 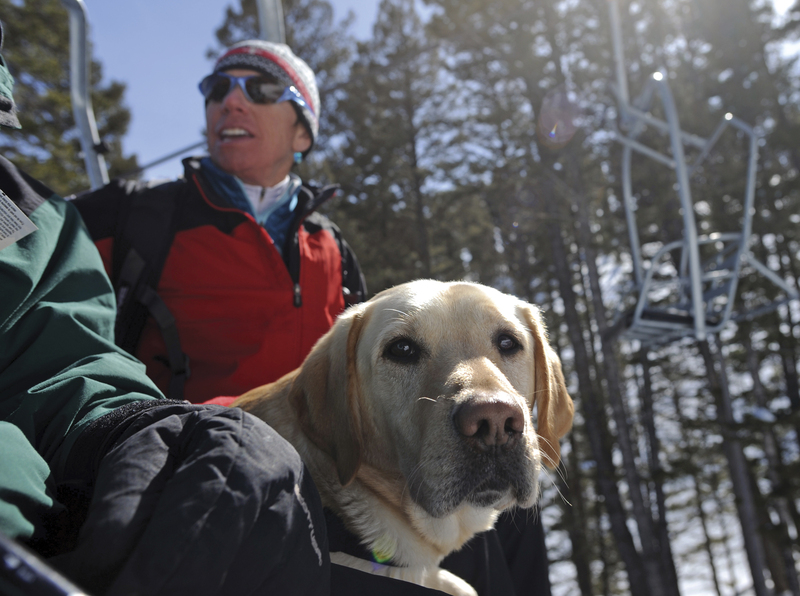 Fay Johnson, Bridger Bowl ski patrol director, rides the Pierre’s Knob chairlift with trained avalanche rescue labrador Ethel in Bozeman, Montana.